We are not Irish, but we have some Irish relatives and we are up for celebrating any holiday – especially when it involves good food. It’s always been a tradition in our family to make a special meal to celebrate St. Patrick’s Day. 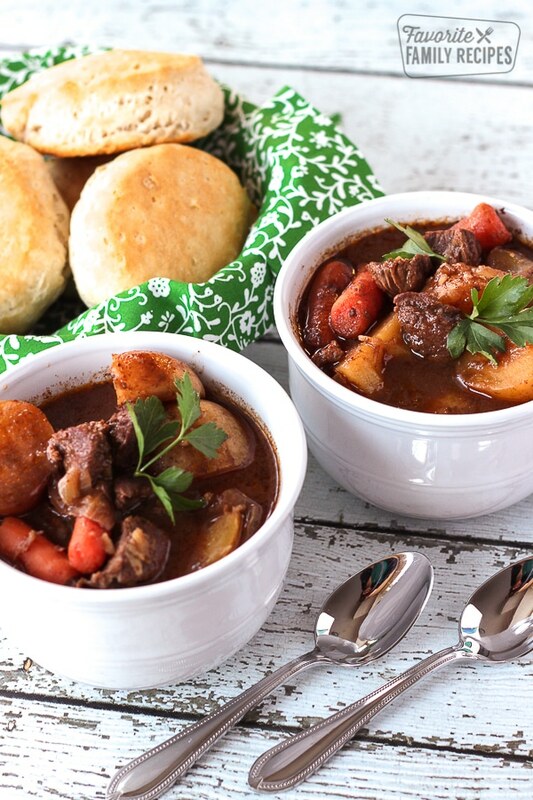 This Slow Cooker Irish Beef Stew is perfect for the occasion! One year I made an all green dinner. We had green meat loaf, green mashed potatoes, green salad, broccoli, green jello, and green Kool-Aid to drink. Another year we made green eggs and ham. We love the Donovan’s Irish Pasties. We also have a collection of 10 Green Recipes for St. Patrick’s Day. And for dessert, don’t miss our version of McDonald’s Shamrock Shake. 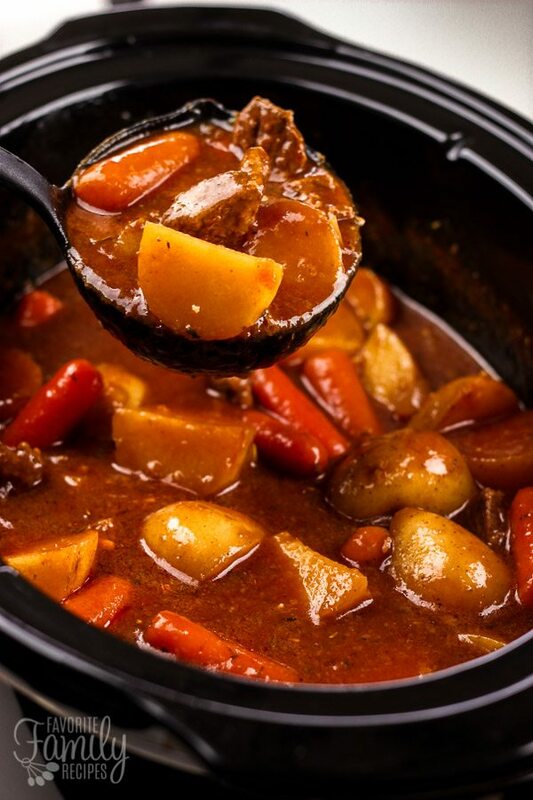 As for this recipe for Slow Cooker Irish Beef Stew, the beef is so tender and juicy from cooking all day on a low heat. I like to cut the vegetables in large chunks so they don’t get soggy when cooking with the beef. You can try different seasonings to suit your taste. It’s always good to start out with a little and then add more if you would like. As I explain in the directions below, you will want to taste test the stew about 30 minutes before serving and add more salt, pepper, and seasonings as needed. I like to serve this stew with our Irish Soda Bread or biscuits and a green side salad. Return the skillet to the stovetop and add butter. Melt the butter on medium-high heat, then saute onions and garlic. Stir in beef broth, tomato paste, red wine vinegar, and Worcestershire sauce. In a small cup, combine cornstarch and cold water. Mix until smooth then add to the liquid mixture in the skillet. This will thicken the liquid. Pour all the contents of the skillet over the meat and vegetables in the slow cooker. it appear there is not enough moisture to do this stew justice….we’ll see…. You’re right – I had 3 cups instead of 3 cans. Thank you so much for catching this! I made the change in the recipe. Does anyone have an estimate of the calories in this recipe? Thanks for posting a non-alcoholic Irish stew recipe! It looks GREAT. St. Patty’s is my birthday, and I am pregnant and have two small kiddoes, so I DEFINITELY didn’t want any traces of alcohol in it (because no… it doesn’t actually cook out that much. Plus, being Mormon… don’t want alcohol in it anyways.) I’m looking forward to feeding this to the missionaries when they come over on Tuesday (one of them is from Ireland, so I’ll let you know his opinion of it!). I do have one question, though–how many does this serve? I’m thinking I should probably double it, but wanted to make sure I won’t be over-doing it! Thanks! Thank you and congratulations on a new addition to your family! This recipe serves 6. I serve it with a side salad and our cheesy biscuits and it is very filling. You probably don’t need to double it, but it is always nice to have leftovers. By the way–the recipe is SO good! Everyone loved it! I definitely keep this on the top of my list. We’re making it for dinner tomorrow along with sourdough bread bowls. Yummmmm. I love your blog–thanks for sharing! This recipe serves 4-6 depending on how much you serve each person. It serves 4 if you are serving in large bowls, or 6 if you are serving in a regular size soup bowl. Good luck with your luncheon! I made this for dinner tonight and it was delicious! I added frozen peas about an hour before it was done cooking. I will definitely be making it again. Thanks Emily! I’m so glad you like the recipe! Why can’t I see the full recipe? Would love to try this! There was a technical issue on our site for a few hours, it should be working just fine now. Thanks! I like to make dumplings on top of stew can this be done with this stew? We haven’t tried that before – but it sounds delicious! Let us know if you do try it! sounds good… How would this be with chunks of cabbage tossed in and if so, when would you insert them? I am sure if would be great! You could probably add them any time. I would probably add them closer to the end. Sounds delicious!! If you were adding alcohol would you add maybe one can of Guinness ?? If you added any alcohol you may want to just cut down on some of the broth so it stays thick 🙂 Hope this helps! I have had this recipe for your Irish Beef Stew in the crockpot all day. The aroma is driving us crazy! Just gave hubby a taste & he thinks it to die for! Cannot wait to scoop up a big in a little while!!! It’s so delicious!!!! Thank you for sharing the recipe! Thank you, Jane! I’m so glad you like the recipe! Thank you so much for posting this recipe that has no alcohol in it. Could you please tell me what size slow cooker you used to make it? Yes, I used a 6-quart slow cooker or crock pot. Thank you for asking! We will add you to our email list and you will have our recipes emailed to you each week. Thank you! Just finished dinner, my wife and I each had a good size bowl of your Irish stew, yum. I followed the recipe to a tea, perfect. Had a Stella and hunks of crusty bread with it, great meal on such a blustery day. Thanks! Thank you for sharing this! I’m so glad you enjoyed it! You can definitely make this in a regular pot on the stove. After adding everything to the pot, cover and let it simmer until the potatoes and carrots are cooked. It will probably take 45 minutes to an hour. Thanks for asking! Can I use lamb stew meat? Made this for the family and I must say, it had an extremely off taste, think I’m attributing it to the vinegar, until now I have never heard of that in stew but I follow your recipe as directed. Is this “off” taste typical of Irish stew? The vinegar is a substitute for the alcohol that is commonly used in Irish stew. You can leave it out if you don’t like the flavor. Thank you for asking! This stew is just so very good! I’m going to make this tomorrow. Defrosting my roast today. I am going to leave the potatoes out because I have 10lbs of russets. I will make mashed potatoes instead. Thank you so much for sharing this without alcohol. You’re welcome! Enjoy the stew! Just made this today. It was delicious. I made a mistake on vinegar. I used rice wine instead if red wine. Grabbed wrong bottle, but it still was so good. Had some sourdough bread with it. Cannot wait to make again. Glad it still worked out for you, despite the vinegar mix-up! Great idea serving with sourdough! Yes, a quality gluten free flour will work just fine in this recipe. Thanks for asking! My husband actually showed me this recipe and he hates soups and stews, says he wants to try this…. I really can’t wait to try!! How many servings would you say this will make? I always like to save that along with any recipe I keep for future use. What makes this wonderful stew IRISH STEW? We love Irish Stew but this version is alcohol-free because we don’t drink alcohol. Some have suggested adding beer to make it more “authentic”. Hope this helps! I am trying the beef stew for tonight’s dinner. I hope it turns out good. If you subbed turkey, would you increase liquid or fat somewhere? Looks divine, thx! I don’t think it would be necessary to add extra liquid or fat. I think you can just add the turkey without adding anything else. Hope this helps! Great recipe!! Love that it is alcohol free 🙂 I prefer Irish stew served over mashed potatoes. I just cut out the potatoes and add more carrots. I thicken it a bit more as needed but this is a great recipe for either, thank you! If I were to do this in the oven, what temperature would I use and for how long? It looks delicious! Hmmmm that is a good question. If you have a big casserole baking dish with a lid you could probably do it on 350 for the same amount of time. Hope this helps! So it’s 3 40oz cans? So that equals 120oz? Or is it 3 cans to EQUAL 40oz? It is equal to 40 oz. So each can is approximately 12-15oz. Hope that makes sense! Can this be frozen? because potatoes tend to not freeze well I find. It can be, but like you said, sometimes the potatoes get mushy and get a weird texture. If you were planning on making way ahead of time, it may be a good idea to prepare and just add the potatoes later. Hope this helps! I would brown the tomato paste with the onions for a better taste. Js.love the recioe. This recipe is absolutely the best! So glad I found it. I’ve made it at least 4 times already and am making it again tomorrow. The combination of spice is perfect!! We are so glad you found it too! 😀 Glad you like it! I don’t know why you are calling it Irish Stew, an Irish stew uses lamb (mutton), not beef. It sounds good though and I will try it but it’s beef stew. What is the instructions for the cheese. What kind of cheese? I would also like to know when you bake is the old fashion mix Master the same as the new paddle mixers.Thank you. Cheese isn’t an ingredient in our Slow Cooker Irish Beef Stew. I’m not sure on your mixer question either. Please email us at [email protected]. Thank you! we typically use 6-7 quart slow cookers. Hope this helps! The soup just simply delicious. Thank you so much! So happy you enjoyed it 🙂 Thanks for the 5-stars!